The long golden curve of Long Beach around the aquamarine waters of Guichen Bay is very pleasant walking to Boatswains Point where the Federation Track follows 4WD tracks and back roads through rich farming country to rejoin the beach again near “Cadara”. The Track leaves the beach to wander through the dense coastal scrub of Benouilli Conservation Park before reaching the tiny fishing settlement of Kings Camp. On its northern side the Track runs through Cape Jaffa Boat Harbour and back to the beach again where dolphins and the occasional seal may be encountered. Eventually Butchers Gap Conservation Park is reached, an avian paradise alive with waterbirds. The Track then follows a walk/cycle path past the relocated Cape Jaffa Lighthouse to Kingston with its long jetty, manicured parks and maritime history. 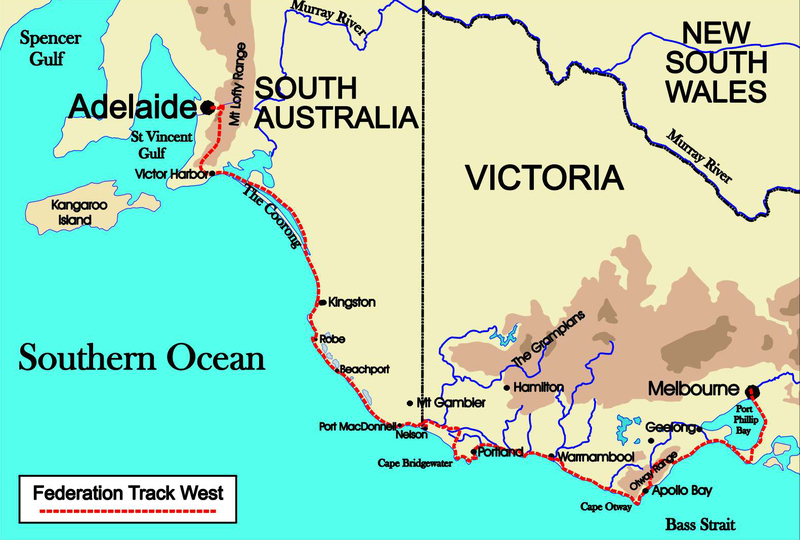 From Kingston, the Track winds its way along Maria Creek and through Rosetown to follow the last beach to The Granites where the Track crosses the coastal dunes to the southern end of the Coorong and heads north. In spring, the shimmering white salt pans become ephemeral lakes, reflecting the unearthly contortions of the Saltwater Paperbarks that ring them and the samphire flats burst into a tapestry of multi-coloured greens accented by red patches of Austral Seabite. The grass flats burst forth in an array of colour as the fluffy white flower of the Muntries compete with the white miniature stars of the Creeping Brookweed and the delicate blue fans of the Dune Fanflower. The Paperbarks and Tea Trees burst into a gold-white froth of blossoms that suffuse the air with the smell of honey. As the lakes evaporate, streaks of pale pink algae contrast with splashes of pastel blue and all are framed by the gigantic dunes covered in olive-green scrub slashed by the giant golden scars of sand-blows. As you travel north the country becomes more remote, wildlife more frequent and the impression of isolation becomes overwhelming even though the busy Princes Highway is only a couple of kilometres away. Along the way you gain distant glimpses of elegant “Cantara” homestead and finally reach the Nukan Kungan Track. 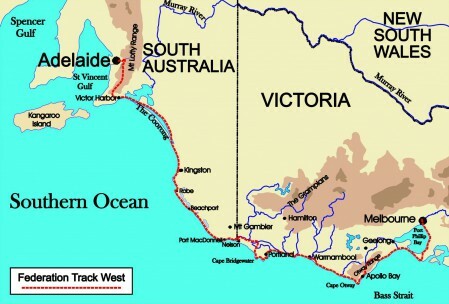 This track wanders along the eastern edge of the Southern Coorong Lagoon past Chinamans Well and countless ephemeral lakes before emerging onto the Nature Trail alongside Pipe Clay Lake. The last few kilometres take you along the delightful Ngrugie Ngoppun Track past Salt Creek Hill (a great spot to view the stupendous sunsets across the Coorong) and the prolific birdlife on Salt Creek to Salt Creek Roadhouse.